What Do Swans, duck, geese Eat & Drink? Swans, ducks and geese are very similar in their diet needs, all love plant based diet and can be feed the same food with just little adjustments. You can read below what do each of them eat and how to take care of them. All swans are vegetarians and will base their diet on plants that they can find in nature. They will eat plants true all of their life, and it is not recommended to feed swans animal mater like meat. Swans can eat under water by submerging their heads, and you will often see them „snorkeling“ when looking for food. If you keep swans or want to feed swans on your nearby lakes and ponds there are some food you can give to them. - Lettuce, spinach, chopped/shredded carrots and other vegetables and greens make a great supplement. 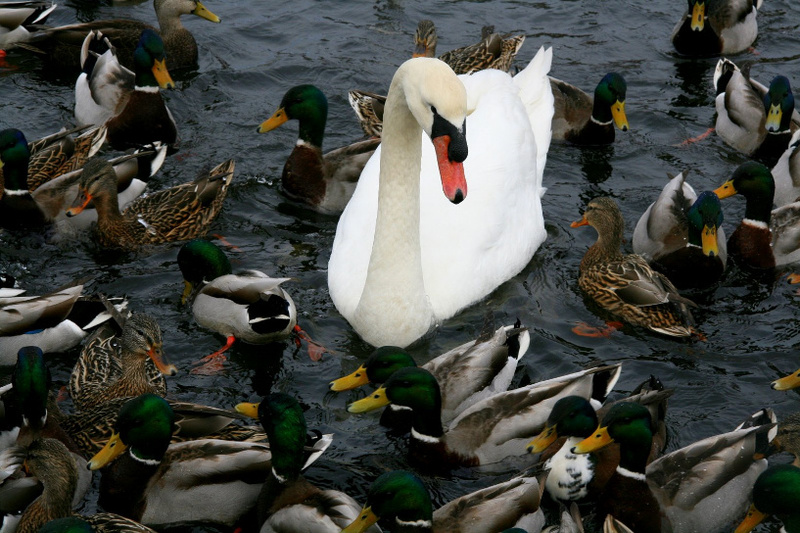 Ducks eat mostly vegetarian diet just like swans. 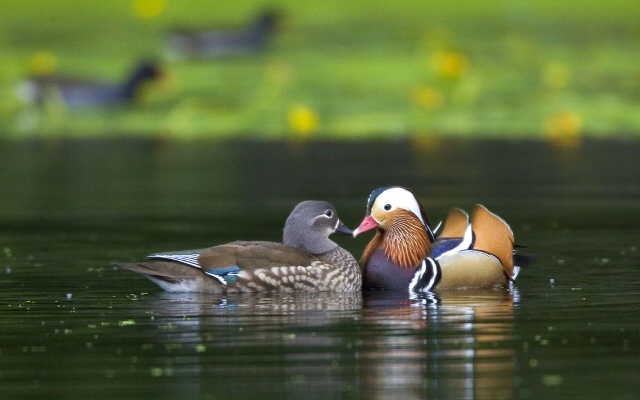 Duck might eat some insects that comes in their way, but they will stick to plant diet most of the time. If you keep ducks the best way is ti feed them comercial duck & chicken feed and pellets. These are made to contain all of the important proteins, minerals and vitamins ingredients for a long and healthy duck proteins, minerals and vitamins. Geese just like ducks and swans will stick to vegetarian diet and it is best to feed them 100% plant mater. If you keep geese and alow them to free-range they may snack on a few insects but it will remain under 1% of their diet at all times. You can give comercial duck or chicken feed to geese, this food is balanced and has all important vitamins, minerals and protein. But add greens and fruit to suplement their diet. People love to walk near lakes and rivers at any time of the year. It’s a great opportunity to enjoy nature, fresh air and wildlife. Often we can see wild ducks, swans and other birds swimming in these waters. These birds can become very friendly can even eat out of your hand when feed by humans. One time I was feeding swans on a lake near my home, and these gracious birds all eat out of my hand, they even bit my finger a few times. And it’s great fun for family and children. The only problem is that humans often feed them bread, and that is utterly unsuitable for them in the long run. A little bread is not going to hurt them, but imagine people coming every day, and only bringing bread? That’s going to have a negative effect on them, and they can have health problems. So if you are going to feed wild ducks, swans and other water birds, please use the food as close to their natural diet as possible. I recommend you to use small, Swan & Duck Food Nuggets , that are made for these birds. These nuggets float on the water to remain accessible longer. The ducks or swans will love this floating duck food, and you can be sure that your birds are getting the right ingredients and stay healthy. Can be used for ducks, swans and other birds that you usually see swimming with them. This food is of the right nutritional value so you are feeding them “the good stuff” and not white bread that can harm them. This floating duck food is great for people, family and children that love to feed these birds but want to provide them with as close as natural diet as possible. Swan - grasses found along side lakes, small insects, and some seed. Ducks – larvae found under rocks, plants, some seed, snails and other small animals. Geese – grass, insects and seed. These floating nuggets contain all of the right ingredients for these birds, you can also brind corn or oats to feed birds at lakes or rivers. Lots of people love to go to lakes and feed bread to ducks, swans and other birds that live there. Bread is not going to provide a proper diet for these birds. Small quantities are probably not going to do much harm, but in the long run it cannot replace the diet these birds need. It is much better to feed them grain and vegetable. In the long run it can be harmful for them due to vitamin deficiency, and brown bread or wholemeal bread which contains seeds is a better choice, as it contains some nutritional value for the birds. You can bring lettuce and ducks and swans will love them.